The Northern Magic Circle 2013 Convention will take place on the weekend of April 6th & 7th 2013 at the Whitby Pavilion, about 20 miles up the coast from Scarborough. The Pavilion Complex and Theatre promises to be an excellent venue for 2013. Tom Crosbie was with us last year as a guest, winning one of the late show prizes. This year we have asked him to perform and lecture. Most of you will know Tom is from York and has built up quite a reputation for his card skills. His card magic is exceptional and he made magic news this year when he released a DVD which he called ‘Recall’. This DVD set contains in-depth material and is designed as a complete guide to the Memorised Deck. Many performers have never used a memorised deck as it is considered difficult to learn. However with his revolutionary approach, Tom quickly and easily goes through everything you will need to make a start. Tom is now a professional magician who has performed all over the world, including a six month run in the House of Illusion in Salou, Spain and is also a regular special guest at Illusions Magic Bar, Bristol. I’m sure you will find him entertaining and informative. Whitby is a lovely old fishing village with many unique shops to visit and local fish and chips to sample. The harbour area, the beaches and abbey ruins are popular attractions. There are many small guest houses offering good value for money and we will be taking advantage of the accommodation bureau service offered by the local Tourist Information Service. We have a great weekend planned, including two close-up shows, the Gala Show, the Children’s Show a cluster of star lecturers and to round it off, a celebration show for the 40th Anniversary of the Northern Magic Circle Juniors, supported by current and former Juniors, Shaun McCree, Danny Hunt and Annette Claire of Amethyst, Sebastian Walton, Toby Davies and a host more. You can also catch up with our Dealers Martin Hunt of MAPro Magic, Brian Berry and others in our Café dealer hall at the Pavilion. We have a great weekend planned and we are pleased to be able to confirm that our headline guest is to be none other than Greg Wilson from USA. Greg came to our Convention back in 2009 and was a huge hit. Greg will not only be giving his brand new lecture at what we believe will be the start of a UK tour but he will be appearing in our Gala Show and will take part in the Close-up shows as well. Gregory Wilson is a two-time FISM award-winner and probably most known for his best-selling instructional videos. In 1998, he was also bestowed (by the International Brotherhood of Magicians) the Most Creative Magician of the Year Award. He has contributed many of his original effects to every major magic magazine in the world as well as a full chapter in Paul Harris’ The Art of Astonishment, a chapter in Harry Lorayne’s Best of Friends 3, a chapter in The Magic Menu and a chapter in the wildly popular Magic For Dummies. (Just don’t hold that last one against him). 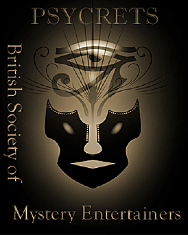 The IBM British Ring convention organisers now have quite a list of artistes, lecturers and events planned for the 2013 get together being held in Buxton from 4th – 8th September. The Opera house and the adjacent Pavilion Gardens will cater for most of the events so let’s look at what is on offer. From the USA comes Skilldini, David Kaplan and Tim Wright, from Spain Eduardo Galeano and also many well known UK performers. The Jeffrey Atkins Memorial Lecture will be presented by Fergus Roy on the Davenport Story whilst Steve Short interviews Ian Adair on his life in magic which I am sure will have plenty about the Supreme Magic Company in it. A tribute to the late Alan Shaxon will also be part of the convention programme. The gala show will be compered by Vincent Hays MBE, well known to many of you for his many appearances at Brick Lane Music Hall in London. Ricky McLeod will present the children’s lecture, and ‘Sooty’s Magic Show’ with Richard Cadell will be the children’s show on the Saturday morning. Guest entertainers on this show will be announced soon. There is to be a Gala of Youth with Ed Hilsum and Megan Knowles-Bacon being already scheduled to appear at the time I write this. The ladies trip (whole day) to Chatsworth House is now nearly fully booked and promises to be a great day out. Dealers booked so far include Practical Magic, Made to Measure Magic, Astra Magic, Peter Diamond, Master of Mystery – Adrian Sullivan, Qualatex Balloons – Graham Lee. Tickets are on sale now for £11 which is a bargain for the fantastic line up of lecturers and dealers. Also all proceeds are going to the cerebral palsy charity so it’s all for a good cause! Chris Rawlins will be lecturing releases from his new book roulette. Chris Rawlins tells people what they are thinking and how they are thinking about it. He demonstrates super-human memory, predicts which chair you will sit in and knows even the most obscure of thoughts! Mexborough Magic Day has now announced that Marc will be joining the convention on the 7th April 2013 at the Corner Pocket Snooker Club, Bank Street. Mexborough in South Yorkshire.